Discover campsites of Vendée France but also over 450 campsites throughout France, offering a variety of rental mobile homes, chalets and accommodation of more atypical as bungalows or caravans, but also leisure facilities such as aquatic areas with sometimes an indoor or well even with heated pool for your comfort, for an unforgettable vacation. Welcome and enjoy your visit in Vendée (85) . 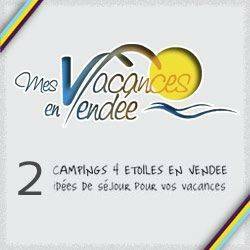 Campsites in Vendée welcome you to your camping holiday 2, 3, 4 and 5 star or LRP. 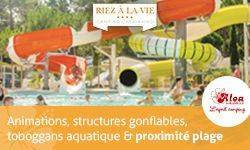 Campsites with recreational facilities (swimming pool, water park, water park, water slides, wading pool, spa, playground, tennis court, multi-sports), entertainment and services (restaurant, bar, food, WiFi access, disabled access, camper services) to make the best of holidays throughout Vendée. Traditional camping in Vendée on pitches or rental of mobile home camping, campsites below offer the best camping in Vendée. 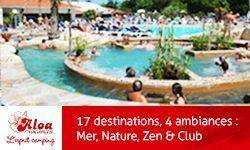 Enjoy the outdoor accommodation and campsites in Vendée! Rental of mobile homes, chalets, bungalows, cottages, Bengali, cottages, trailers, caravans, tipis and camping sites equipped for your holidays in Vendée, our French campgrounds welcome you everywhere in Vendée, a favorite camping in Europe. Have a great holiday camping with our campsites in Vendée! Le camping les logeries les sables d'olonne bord de mer en Vendée camping 3 étoiles calme et familial avec piscine couverte chauffée avec location de vacances en mobil home en bord de mer. Located only 5mn from the charming center of St Gilles Croix de Vie, Europa campsite is the perfect place for yoru family holidays. In a country setting and only few minutes drive to fine sandy beaches, you will find a family atmosphere and a warm welcome. Indoor and outdoor heated pools, 4 waterslides large play areas for the children, inflated castle, trampoline, fit park, table tennis, volley-ball, basket-ball and soccer facilities, games room. Bar and restaurant, take-aways, pizzas, fresh bread. Large well-defined private pitches. Accomodation up to 6 people. The campsite LA CONGE*** is situated in a pleasant and restful setting in the heart of a pine forest.To 900 m ,you can take advantage of the beautiful fine sand beach La Pège.On all of locations, more than 60 are still reserved for tents or caravans, rest being fitted out by mobil-home or chalets to be rented. With its small islands ,the ground is ordered well, shaded ,sometimes flat, sometimes with rockslides. In this wooded environment, you will spend of pleasant holidays. The campsite has a heated outdoor swimming pool, a petanque court, a playground for children, and a multisports court. You will appreciate nearby strolls on the pedestrian paths or on the bicycle paths which sprinkleon one side the forest and with the other one the swamps. Then,see you soon for your holidays with us in Vendée! Camping de Brétignolles-sur-mer with swimming pool in the Vendée, the 4-star LES VAGUES campsite, offers you the marriage of the sea and the countryside. The campsite is located in a green and flowered park, 900m from the beach and only 100m from shops and the market, and from the cycle paths. Possible rental of mobile homes or camping sites. The campsite is equipped with a covered and heated swimming pool at the disposal of guests, with jacuzzi, sauna and fitness room. As well as an outdoor heated swimming pool, a pool with water slide and a water park for your children. Free WIFI on the whole campsite. Idéal pour des vacances entre amis, en couple ou en famille, le camping les "Blancs Chênes" 4 étoiles vous accueille dans le Sud-Vendée pour des vacances fun et conviviales et vous propose de nombreuses activités. Your Vagues Oceanes SEASIDE CAMPSITE, Brem sur mer, 800 m to the beach is located between Sables d'Olonne and Saint Gilles Croix de Vie, ideal starting point for holidays in Vendée. Two heated swimming pools including a covered pool, the joys of swimming will be on the program. To spend unforgettable moments, camping Le Brandais offers a large choice of activities for adults and children and many services are available! Camping Riez à la Vie welcomes you in a wooded setting, conveniently located on the Vendée coast, 1000m from the sandy beach. On-site, outdoor pool with waterslide and wading pool, indoor swimming pool available at the opening of camping with jacuzzi. NEWS 2018 : SAUNA HAMMAM. Entertainment and services (bar / deli / snack) open all year round. Fitness room, bouncy castle, trampolines and outdoor play area. Come and share unforgettable moments in a family and dynamic atmosphere. At the heart of the Forest of Sin Sea, between sea and river, on a peninsula, camping les Flots Bleus welcomes you in a family atmosphere. 150m from the sandy beach with direct access, facing the Ile de Ré. Outdoor play area, trampolines. Services around the campsite (mini-golf, takeaway, children's) Come spend moments of unforgettable holidays. Indoor / discovery swimming pool... The city center is 500m and 300m port. Do not wait, book now! The Campsite le Grand Jardin at Notre Dame de Monts in Vendée (Atlantic Coast) will offer you a flowery, verdant and calm environment and various types of comfortably accommodation (mobile homes and chalets) or traditional camping pitches for your tent, caravan or camping -car, to be closer to Nature. For fishing, you have direct access to the river at the bottom of the campsite just for you. During July and August, a children's club will entertain your children every day from Monday to Friday. The campsite Le Grand Jardin offers a beautiful heated indoor or outdoor swimming pool, a secured playground, a bowling alley. 1500m from the beach, 500m from the town center and shops and 300m from the forest. Come and discover its beaches, its forests and its marshes between Saint Jean de Monts and Noirmoutier. You will appreciate the ambiance of the Vendée coast and the simple pleasure of conviviality. 3 stars campsite in Brétignolles sur Mer in Vendée(85) from the Atlantic Coast. Welcome to the campsite Le Marina, on the Côte de Lumière in Vendée, 1 km from the seaside. Our campsite is ideally located between Les Sables d' Olonne and Saint-Gilles-Croix-de-Vie. We are equipped with a covered and heated swimming pool. The campsite is open from 1 April to 30 September. 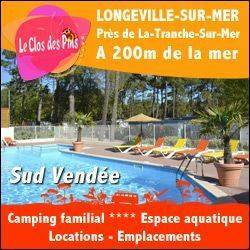 We offer pitch rental or mobile home rentals on our campsite in Vendée. Available: playground, bicycle paths. The town centre and shops are 1 km away, and a pond is accessible at 400m from the campsite. Situated on the atlantic coast, in Vendee, our campsite 4 stars welcomes you from april to september. Fine sand beaches and wide forests of Saint-Jean-de-Monts will be perfect for your vacation. Our family company offers you numerous services which will make of your vacation an unforgettable moment : Swimming pool covered, spa and playful pond, swimming-pool with slide, wading pool with children’s slide, playground, snack/bar, gaming room and gym area. In this charming surrounding, we provide comfortable and well equiped mobile-home and flat, grassy and enclosed pitches for tents, caravans and camper vans ! Let'go for unrivalled vacation ! Campsite France in Vendée(85), the 4 stars campsite in Saint Hilaire de Riez, near Saint Jean de Monts and Les Sables d'olonne. If you find these landscapes tempting, then come and join us at our friendly family campsite. A the domaine des salins, you can choose for heated indoor or outdoor swimming pools, you can swim, splash, laugh and never get tired of it. We offer : Top quality mobile home and wooden chalet rentals, or if you prefer spacious, semi-shaded campsite pitches for tent, caravan or camper van. Make the most of your stay at the Domaine des Salins to visit Vendée, its beaches, islands, heritage and gastronomy. You can enjoy all the activities and events throughout the year. 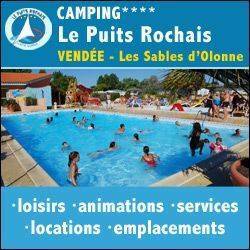 4 star campsite in Saint Jean de Monts in Vendée near the seaside. Camping de l'Océan offers you comfortable accommodation and pitches for your tents, motorhomes and caravans. A family establishment between the sea and the forest 700m from the city centre, come and enjoy the Atlantic coast and the relaxed atmosphere of the Vendée. And to enhance your stay or holiday in the seaside resort of St Jean de Monts, we offer a wide range of services on site, such as the Snack-Bar with evening entertainment. And above all, in 2019, enjoy the new aquatic area, with its heated indoor swimming pool and its playful paddling pool. Découvrez le camping Vendée Villa Campista 3 étoiles à Saint Hilaire de Riez entre Saint Gilles Croix de Vie et Saint Jean de Monts pour vos vacances . The Flower campsite Beauchêne 3 stars is situated to Avrillé in 7km sandy beaches at the end. We welcome you in a quiet and natural frame. You can take advantage of our outside and warmed swimming pool while the children will have fun on trampoline or the inflatable game. Choose to rent one of our huts nature, on piles hut, Coconut Sweet, Freeflower, mobile home any comfort or natural location to spend dream holidays in family. Animations are proposed in July and August for small and big. We are situated in only 5 minutes of the leisure park Indian Forest and the quite new water park O gliss Park, of which to make happy. We are the ideal campsite for your holidays between friends or in family. See you soon to the Flower campsite Beauchêne ***! 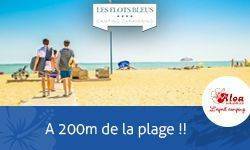 4 star campsite in Vendée, near Les-Sables-d'Olonne and St-Gilles-Croix-de-Vie, 5 km from Bretignolles-sur-Mer, in a family and nature setting. Enjoy our various accommodations, mobile home rental for 2 to 8 people with covered terrace, TV included, novelty 2017 mobile home 4 bedrooms for large families, Rental bungalow toilés 4 to 5 persons, rental pitches canvas tent, caravan, camper van. Snack bar, bicycle rentals, playground, (Karaoke, lotto, dancing, clown, magic, hypnosis ...), activities for children (from 3 to 14 years old) Wellness room (sauna and jacuzzi), water park for adults and children. Come and experience great moments of happiness at the 4 stars campsite l'orée de l'océan, our team welcomes you in a family atmosphere and convivial. Come and discover our BOBI mascot that will enchant your children. See you soon at the 4 stars campsite l'orée de l'océan. 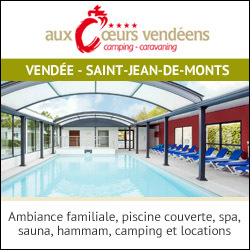 Are you looking for a campsite in St Jean de Monts en Vendée for your next holiday? Then we propose you to spend with us a stay or more, in our 2-star campsite, Le Cormier, near the seaside. Located close to the city center, we offer you the rental of mobile homes. The campsite is appreciated by its clientele for its calm and family atmosphere. The campsite is equipped with a heated outdoor swimming pool. We are located in the heart of the seaside resorts, take advantage of it to visit the coastline, the bocage, the islands of Vendée... So see you soon for an unforgettable stay in the Vendée. Situé en bord de mer, le camping "Le Bellevue" 4 étoiles, vous offre une sublime plage de sable fin à proximité et vous baigne dans l'ombre fraîche d'une pinède, pour des vacances au rythme du mot détente. Bénédicte and Alain welcome you to their campsite in the heart of the Vendée. From April to September, come and discover our 4-star establishment with 115 pitches in a calm and friendly 2 hectare setting. 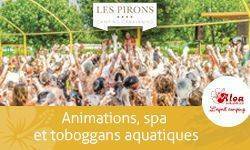 On the edge of the state forest of Saint-Jean-de-Monts and 700 metres from a beach with lifeguards, you will appreciate the family-oriented and friendly atmosphere, the numerous activities offered and the new well-being space. Make use of the direct access to the cycle trails that run along the “coast of light” and cross the Breton marshes. The ideal location of the campsite will allow you to visit numerous places, such as the Vendée isles: Yeu and Noirmoutier. In France, your campsite in Vendée along the sea front. Just 200m from the beach, le Clos des Pins invites you to enjoy a relaxing atmosphere in a privileged setting. At the heart of a pine forest between Longeville-sur-mer and La Tranche-sur-mer in the southern Vendée region, you’ll be able to benefit from the services and comforts of this 4-star campsite beside the sea, whilst drinking in the natural setting of our beautiful Les Conches beach. Bénédicte & Alain welcome you to Plein Sud, a place where life is enjoyable...Plein Sud is ideally situated at the seaside, 800m from the beaches, between Noirmoutier and St-Gilles-Croix-de-Vie.Also a direct access to the bicycle paths which follow the Atlantic coast and travel the Breton swamp. Our 4-stars campsite welcomes you from April till September in St Jean de Monts in the Vendée (85) and invites you into an unforgettable journey in the heart of a natural frame. Plein Sud offers you in peak season quality services, varied animations, kid's club, bar, heated outdoor swimming-and paddling pool and don't forget our new waterpark. So,don’t hesitate anymore, choose Camping Plein sud as your next holiday’s destination ! Le California est un camping familial à Saint Jean de Monts en Vendée à 3 km de la plage avec piscine couverte chauffée jacuzzi toboggans wifi animations.